There are many ways to effectively treat issues like hyperpigmentation, sun damage, scarring, signs of aging, and other skin imperfections. 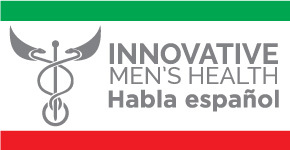 Innovative men's Health understands that each issue is as unique as the individual it is affecting. From Microneedling to peels, skin resurfacing to the Non-surgical facelift, Let us help you look and feel your best. Come in for a treatment and see the surface of your skin TRANSFORM! Can erase acne scars right before your very eyes. Microneedling is also known as collagen induction therapy and promotes cell regeneration. This is the BEST treatment for large pores, acne scars, fine lines, photo-aging, and tightens the skin. It helps to rejuvenate, re-texturize, and resurface the skin. It also reduces scars and stretch marks and can be done almost anywhere on the body. At Innovative Men's Health, we feature the Skin Stylus microneedling pen. This particular pen has the smallest and finest gauge needles on the market making it by far, the most comfortable treatment option available today. We apply numbing to the area being treated and wait for approx 20 min. Then we create tiny channels on the skin, which helps to stimulate collagen and elastin. Microneedling excels at smoothing out the sensitive areas around the eyes and crow’s feet as well as those upper-lips wrinkles. What Should I expect at my Microneedling appointment? We apply numbing to the area being treated and wait for approx 20 min. Then we use our Skin Stylus to create tiny channels on the skin, to stimulate collagen and elastin. We feature the Skin Stylus microneedling pen which is, by far, the most comfortable treatment. Not quite, We finish with luxury brand skin care serums that are rich in advanced ingredients such as botanical stem cells, peptides and vitamins, These serums are important for hydrating and contain protective ingredients vital to maintaining and enhancing the skin. How long is my microneedling recovery time? There is minimal recovery time as well with this treatment, social downtime is the first 2-3 days. We recommend coming in for a treatment on a Friday eve and then taking the weekend off. You will want to have extremely gentle cleanser and moisturizer on hand for the first 3 days. We recommend 3-6 treatments. As most of us age, we begin to see visible signs of sun damage appearing on the skin in the form of spots. Whatever you want to call these little skin discolorations, they can be very annoying and tend to make the skin look older. Hyperpigmentation is a (usually) harmless condition in which patches of skin become darker in color than the normal surrounding skin. This darkening occurs when an excess of melanin, the brown pigment that produces normal skin color, forms deposits in the skin. What can be done for skin spots & Hyperpigmentation? Let our IPL/Photofacial treatment improve the tone and clarity of your skin, and you too will be able to finally say good bye to sun damage, rosacea, redness, veins, acne marks, scars, age spots, and melasma. We use the Alma Dye VL laser to dramatically target brown pigmented areas and red vascular imperfections on the face and body. This laser is extremely effective thereby requiring less treatments. The particular laser treatment has been featured on "The Drs"
intense pulsed light’s wavelength is concentrated so it is safe and more consistent, but also has a cooling tip to make it more relaxing.This laser has a cooled tip and In Motion technology that makes the treatment more comfortable than other lasers. It also stimulates cells that produce collagen, so skin texture is firmer. After 1-2 weeks, spots get darker, slough off, and disappear to reveal flawless, even-toned skin. IPL/Photofacial can treat sun damage on any part of your face and body. Many people find this treatment especially effective on the chest, shoulders, arms and anywhere there has been more sun exposure and damage . Come get a treatment and kiss those dark spots goodbye. Good news! This treatment is much more cost effective than some lasers. Come in for your consultation. We can refresh your skin, reduce pore size, and make your skin look like you have never even had a breakout! * Currently only available at our Bellevue location. Acne scars are embarrassing and can hurt self esteem. Get rid of the once and forever! Our acne specialist will help determine your level of acne and possible triggers.We also analyze your diet and focus in on what can be the promoting this issue, from the inside out so new breakouts don’t keep popping up. What is our process to get rid of Acne? Honestly? Acne takes a whole arsenal of weapons. That’s why just using benzyl peroxide and salicylic acid won’t cure the problem. Chemical and enzymatic peels are great for cleaning out pores and reducing red marks left behind. Microneedling can erase acne scars right before your very eyes. This is one of the most effective treatments for acne scars and can be done on darker skin types. 5 -8 treatments, depending on the severity of your scars. "Melasma (muh-LAZ-muh) is a common skin problem. It causes brown to gray-brown patches, usually on the face. Most people get it on their cheeks, bridge of their nose, forehead, chin, and above their upper lip. It also can appear on other parts of the body that get lots of sun, such as the forearms and neck." Melasma tends to be more frequent with women than men. This is especially true of pregnant women. In fact, melasma is sometimes called "the mask of pregnancy" due to the frequency in which it occurs in pregnant women. Chloasma is another name for Melasma. It is a temporary darkening of the skin, primarily on the face. While it usually fades, some people have it for years. Who is likely to be affected by Melasma & Chloasma? It is said that Melasma & Chloasma affects over five million Americans and generally appears on people with darker skin tones because they have more active melanocytes than those with lighter skin tones. This the hardest thing we treat in skin care. But we have found a way to combat this problem using several modalities…TOGETHER. Dye VL’s narrow band of light targets the melanin and broken up pigment, which lifts and exfoliates like no other IPL laser! Retinol Brightening Serum – the most powerful lightener with 2% retinol, plus Kojic Acid, Alpha Arbutin, and Liquorice Root. PCA Peel with Hydroquinone and Resorcinol – medical grade peel fades stubborn surface pigment in between Dye VL treatments. SheerZinc Sunscreen – protect your new, beautiful, even-toned skin and prevent any new pigment spots from popping up. What is a Vascular Irregularity? Rosacea is a fairly common vascular abnormality that tends to most frequently afflict people with fair skin and blue eyes. While the exact cause is not currently defined, the resulting blush of the skin is caused by prominent blood vessels found near the surface of the skin and most common on the face. Why is the Dye-VLlaser the The Technology of Choice for Treating Vascular Lesions? Spider Veins, Rosacea, facial flushing, and vascular imperfections just underneath the surface of the skin can all be treated with the Dye-VL Laser. The Dye-VL utilizes a narrowband (500-600nm) wavelength that allows the precision required to target only the melanin in the lesion or blood vessel. This laser gives the perfect amount of energy to achieve superior results and get rid of the red. 2-3 treatments recommended, depending on the size and severity. Come see the difference! Stretch marks are just exactly that - It is where the skin has been stretched, usually from rapid growth, and often results in a discolouration. This happens when the skin can not bounce back from an intense period of growth. While stretch marks may fade - they don't always disappear. Stretch marks are common during puberty for both boys and girls. As adults - Weightlifters commonly develop stretch marks. Laser therapy & Microneedling have both been proven effective for stretch mark removal. Microneedling is great for helping to eliminate stretch marks. After the Microneedling procedure is done and as the body is healing, it generates new collagen which is used to heal the original tear in the dermis that cause the stretch mark to show initially. 5-8 treatments as well as a few laser treatments. NOTE: These modalities work well together to really change and reverse the process as though the stretch mark never even existed. Why live with your stretch marks when you can fade or get rid of them altogether? Come in for your consultation, to get pricing and wear your sandals with pride!